ACT: Advocate for clemency for Troy's August 9th board hearing. TROY DAVIS,PLEASE REMEMBER THAT AMERICA IS NOT THE OLD SOUTH ~ AFRICA !!! A $TATE ECONOMIC BOYCOTT OF GEORGIA INTERNATIONALLY WILL OBVIOU$LY BE THE END RE$ULT OF GEORGIA DECIDING TO MURDER A PO$$IBLE INNOCENT TROY DAVI$ WITHOUT A NEW AND FAIR TRIAL ? US CONGRESSIONAL MEMBERS WHO ARE ALSO LAWYERS BY TRADE, CONTINUE TO DENY poorer AMERICAN'S PROPER LEGAL REPRESENTATION !!! THE INTERNATIONAL COMMUNITY NEEDS TO BEGIN A FORMAL INVESTIGATION INTO THESE US CONGRESSIONAL CRIMES AGAINST HUMANITY, AND HUMAN RIGHTS VIOLATIONS BEING INFLICTED ON poorer AMERICAN'S LIKE MR.TROY DAVIS OF GEORGIA !!! HAVING BEEN DENIED APPEAL LAWYERS FOR THREE YEARS ON DEATH ROW IN GEORGIA MR. 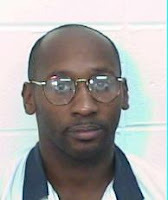 TROY DAVIS IS NOW BEING EXECUTED FOR A CRIME HE MIGHT NOT HAVE EVEN BEEN INVOLVED WITH !!! SENATOR OBAMA PLEASE LET THIS COUNTRIES VOTERS KNOW YOUR FEELINGS AND THOUGHTS ABOUT A NEEDED FUTURE REPAIR AND RENOVATION OF OUR BROKEN JUDICIAL SYSTEM THAT CONTINUES TO ALLOW THE EXECUTION'S OF EVEN POSSIBLE INNOCENT AMERICAN’S LIKE TROY DAVIS OF GEORGIA ????? BEING THE WEALTHIEST COUNTRY IN THE WORLD SENATOR OBAMA, DON'T WE NEED AS THE LEADERS OF THE FREE WORLD TO BEGIN ONCE AGAIN TO RE-INVEST THE PROPER MONIE$ IN OUR OWN US JUDICIAL SYSTEM, ASSURING ALL OF OUR CITIZENS THEIR RIGHTS TO FAIR TRIALS WITH PROPER LEGAL REPRESENTATION ??? DOES GOD NEED TO LOBBY OUR US CONGRESSIONAL LEADERS OF THE FREE WORLD ON BEHALF OF OUR poorer american’s SENATOR OBAMA,OR ARE YOU WATCHING OUT FOR THEM ?? ***OUR US CONGRESS CONTINUES TO DENY MIDDLE CLASS AND WORKING POOR AMERICANS PROPER LEGAL REPRESENTATION EVEN THOUGH WRONGFUL EXECUTIONS & FALSE INCARCERATIONS CONTINUE ALL ACROSS AMERICA ??? *** 700 BILLION $$$ AVAILABLE FOR US BAILOUT, & NO $$$ FOR ALL POORER AMERICANS PROPER LEGAL REPRESENTATION ? SENATOR OBAMA, THIS JUDICIAL INJUSTICE HAS BECOME AN AMERICAN ART FORM, AND NO LONGER CAN BE KEPT HIDDEN OR SECRET FROM THE AMERICAN PEOPLE EVEN IF CERTAIN (501c3) U$ RELIGIOU$ LEADER$ HAVE BEEN $ILENCED ?? LETS ALL HOPE OUR MEDIA FRIENDS CONTINUE TO SHOW AN INTEREST IN REPORTING ON THIS AMERICAN HORROR FACING THESE (TENS OF THOUSANDS) FORGOTTEN AND TRAPPED POORER AMERICANS, AND HOW THIS PRESIDENTIAL CONTENDER HANDLES THIS VERY SERIOUS ISSUE FACING AMERICA’S LATINO AND BLACK AMERICAN COMMUNITIES ???? WITH 80% OF THE BLACK AMERICAN VOTERS SAYING THEY SUPPORT SENATOR OBAMA IN THIS PRESIDENTIAL ELECTION, IT IS ONLY FAIR FOR EVERYONE TO KNOW PRIOR BEING ELECTED OUR NEXT PRESIDENT OF THE UNITED STATES HOW THIS DEMOCRATIC SENATOR TRULY FEELS ABOUT THIS AMERICAN JUDICIAL INJUSTICE CONTINUING TO INFLICT GRAVE HARM ON THE BLACK & LATINO AMERICAN FAMILIES AND THEIR COMMUNITIES NATIONWIDE ?????? *** WHEN GOD’S FACE BECAME VERY RED *** THE US SUPREME COURT GAVE ENEMY COMBATANTS FEDERAL APPEAL HC RIGHTS LAWYERS AND PROPER ACCESS TO US FEDERAL COURTS,AND POORER AMERICANS (MANY EVEN ON DEATH ROW) ARE DENIED PROPER FEDERAL APPEAL LEGAL REPRESENTATION TO OUR US FEDERAL COURTS OF APPEAL, AND ROTTING IN AMERICAN PRISONS NATIONWIDE ????????? **** INNOCENT AMERICANS ARE DENIED REAL HC RIGHTS WITH THEIR FEDERAL APPEALS ! THE AMERICAN PEOPLE ARE $LOWLY FINDING OUT HOW EA$Y IT I$ FOR MIDDLE CLA$$ AND WORKING POOR AMERICAN$ TO FALL VICTIM TO OUR U$ MONETARY JUDICIAL $Y$TEM. ****WHEN THE US INNOCENT WERE ABANDONED BY THE GUILTY **** The prison experts have reported that there are 100,000 innocent Americans currently being falsely imprisoned along with the 2,300,000 total US prison population nationwide. ***WHERE ARE AMERICA'S RELIGIOUS LEADERS ??????? Since our US Congress has never afforded poor prison inmates federal appeal legal counsel for their federal retrials,they have effectively closed the doors on these tens of thousands of innocent citizens ever being capable of possibly exonerating themselves to regain their freedom through being granted new retrials. This same exact unjust situation was happening in our Southern States when poor and mostly uneducated Black Americans were being falsely imprisoned for endless decades without the needed educational skills to properly submit their own written federal trial appeals. This devious and deceptive judicial process of making our poor and innocent prison inmates formulate and write their own federal appeal legal cases for possible retrials on their state criminal cases,is still in effect today even though everyone in our US judicial system knows that without proper legal representation, these tens of thousands of innocent prison inmates will be denied their rightful opportunities of ever being granted new trials from our federal appeal judges!! Sadly, the true US *legal* Federal Appeal situation that occurs when any of our uneducated American prison inmates are forced to attempt to submit their own written Federal Appeals (from our prisons nationwide) without the assistance of proper legal counsel, is that they all are in reality being denied their legitimate rights for Habeas Corpus with our US FEDERAL COURTS and will win any future Supreme Court Case concerning this injustice! For our judicial system and our US Congressional Leaders Of The Free World to continue to pretend that this is a real and fair opportunity for our American Middle Class and Working Poor Citizens, only delays the very needed future change of Federal Financing of all these Federal appeals becoming a normal formula of Our American judicial system. It was not so very long ago that Public Defenders became a Reality in this country.Prior that legal reality taking place, their were also some who thought giving anyone charged with a crime a free lawyer was a waste of taxpayers $$. This FACADE and HORROR of our Federal Appeal proce$$ is not worthy of the Greatest Country In The World! ***GREAT SOCIETIES THAT DO NOT PROTECT EVEN THEIR INNOCENT, BECOME THE GUILTY ! ** A JUDICIAL RIDE OF ONES LIFE ! ***Someone please tell our US Congress that the GED degree that Manny Gonzales acquired in prison is not a LAW DEGREE !!!!! !